Smartsheet Control Center enables consistency of work execution with reduced operational risk. Improve Consistency of DeliverySet up new projects and processes automatically with a standard set of components that make it easy for teams to get to work right away — the right way. Prioritize the Most Important WorkImplement approval workflows easily that allow the organization to automatically vet new projects and processes before new work kicks off. Drive Adoption of Best PracticesIncorporate organizational best practices for work execution, reporting, and risk management as standard components in every new project or process. Eliminate Manual ReportingNew projects and processes are automatically included in KPIs surfaced in Smartsheet dashboards. Ongoing work is updated and reflected in real time — with no extra work or additional status meetings. 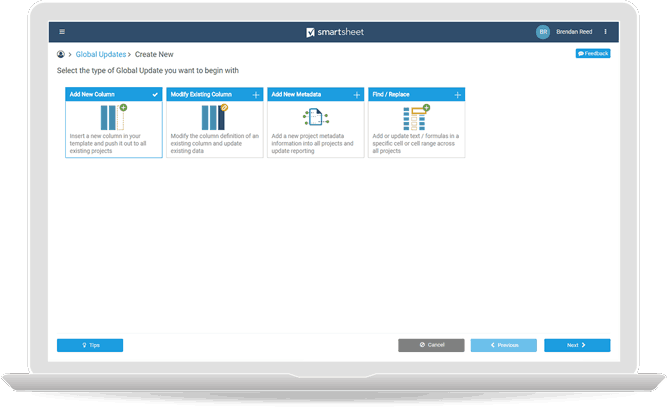 Analyze Portfolio PerformanceEasily connect the datamart created by Smartsheet Control Center to third party BI tools like Power BI to perform powerful portfolio analysis. Say “Yes” to ChangeWith Global Updates, you can make changes across your entire portfolio, program, or processes at once. Maintain ConsistencyOnce changes are finalized, you can quickly verify that changes were made exactly as planned. Drive InnovationGlobal Updates fosters process innovation and drives competitive advantage by embracing continuous improvement, at scale. "It’s an easy sell when you talk about ROI and what Smartsheet can provide from a numbers perspective, if we can decrease the amount of time it takes us to do a construction project by just a week."